The Canary Islands stand jutting out into the Atlantic, close to both the old and new equator and thus with a delightful climate and ocean breezes. Storms are their only concern, and storms will be their undoing during the pole shift. With ocean water on all sides, and nothing to break the wind, they will be subject to overwash from massive ocean waves colliding as water moves both to and from the poles, and into and out of the Mediterranean. Hurricane force winds likewise will batter these tiny islands full force, so seeking high points on the islands as an escape from the huge waves will only get one washed away. Would be survivors are advised to seek a home elsewhere, until long after the shift has passed. Will La Palma volcano in the Canary Islands, which is already damaged, experience an earthquake and fall into the sea prior to the pole shift and thereby cause a huge tsunami? 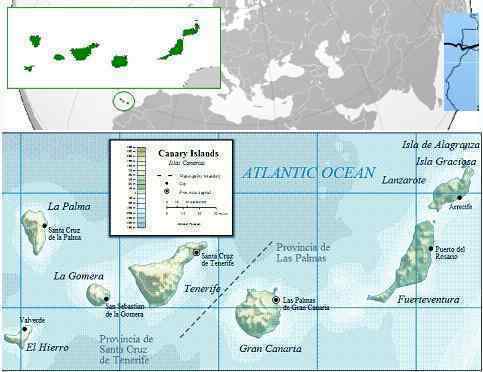 It has long been postulated that the Canary Islands are fragile, and will collapse into the sea upon another quake, creating a tsunami. This is a human theory, and absurd. First, monstrously high waves are not caused by displacement of water across the ocean, as water moves in all directions, and the pressure reduces steadily during the distance traveled. Do these human theorists presume that tunnel vision exists in the ocean, such that pressure only moves in one direction? This is akin to the human propensity to divide what they are dealing with into tiny bits, and only consider a bit at a time, as though putting the bits together is too much of a headache. Thus, Newton's supposed Laws are considered separately from Einsteins math, as they don't work together. A land slide, under water, will create not a force of water moving across the ocean, but a void causing water to fill that void. Thus, a swirl of water, moving into the void and then out again, would occur, locally.